There are literaly thousands – maybe tens of thousands of non-sport cards in existence. I've picked just two of them to include on my Web site. 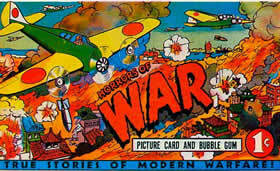 The Horrors of War set is quite probably the most famous non-sport card set ever issued. It was issued by Gum Inc., the predecessor of the Bowman Gum Company, starting in 1938. The illustrations are colorful, detailed and gruesome. 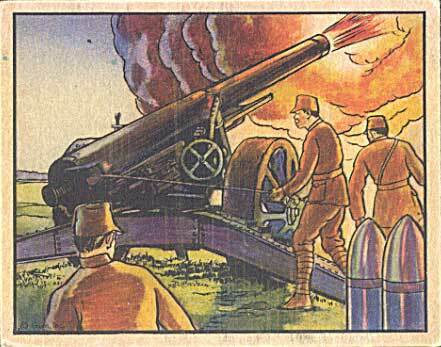 Conceived as a 240-card set about the Chinese-Japanese War, the Ethiopian War and the Spanish Civil War, the set proved so popular that an additional 48 cards were added about Germany and the beginning of World War II. The addition of these 48 cards to the set did not prove as successful as Gum, Inc. anticipated and hence the last 24 cards and in particular the last 12 cards have proved very elusive to collectors. 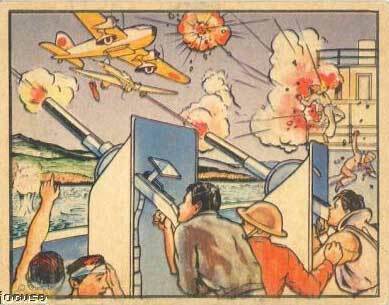 Any card picturing Hitler is especially desirable. 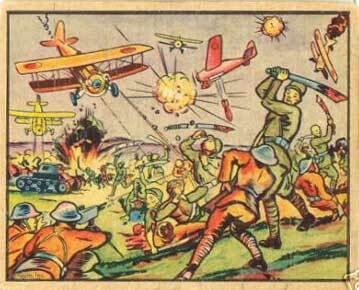 The card on the left is #2, "Chinese Big Sword Corps Resists Jap Forces". The complete set can be seen (on the Network54 Forum, by clicking here. The American Card Catalog designation is R69. In 1950, the creative minds at Topps decided that they could sell even more bubble gum by inserting trading cards. 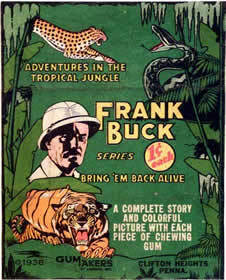 The first trading cards were Hopalong Cassidy, the TV and film cowboy; and "Bring 'em Back Alive" cards, featuring Frank Buck, the master trapper, in Africa. I think these were the first cards I ever collected as a kid. What 10-year-old could resist pictures of a python swallowing a baby pig, a tiger attacking an elephant, a leopard and a crocodile wrestling, canibals, blow guns, etc. 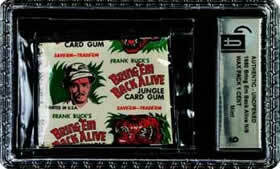 This Topps set may have been patterned after the successful Gum, Inc. issue of 1938 (R55). The cards measure 2 1/16" x 2 5/16". 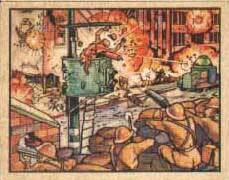 They came attached, in panels of 2, much like the Topps 1951 baseball card offering. Follow this link to images of the complete set (courtesy of the Network54 Forum).